In 2017, I have spent nigh one whole month in the Marvao area, Alentejo, Portugal and I look forward to my hopeful return in Spring. What attracts me to this particular area? Well, largely due to my last holiday in the Lake District, September, 2016. It was one of those seminal moments when I realised that although I love clambering over mountains even in really poor weather, my photographic opportunities were few and far between. On this holiday the weather was the worst the Lake District could throw at me and I still managed to do Helvellyn and the Wainwright “Superman” walk. I came to a point that I just had enough of the dark and bad weather in the UK and the almost futile chasing of that all too brief light. Over the past few years when my wife visited her parents in Portugal I would go galavanting over mountains. Free and unencumbered I could hike and photograph to my hearts content. It is a rewarding, cathartic and highly therapeutic endeavour. This time, however, when my wife asked me if I wanted to go to Portugal with her, I think my positive answer genuinely surprised her. 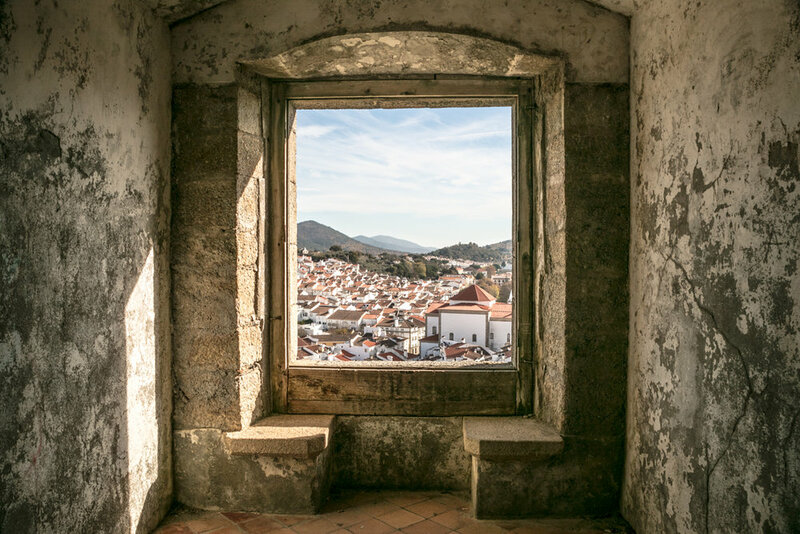 She would talk excitedly about beautiful Marvao, and dinner at Jorge’s and her iPhone photos of beautiful open blue skies combined with my had-a-gutful-of-British-bad-weatherness firmly tipped the balance in favour of Portugal for my annual holiday. The Marvao area of the Alentejo near the Spanish border is a wonderful palette of texture and light. The landscape is strewn with huge granite monoliths, twisted cork oaks, twisting roads and dilapidated farms and homesteads that are so rich in texture. This ancient and historical landscape bathes beneath an oft clear blue sky. The most brilliant azure. I could spend many happy hours walking around the hill-top fortresses of Marvao and Castelo de Vide. The narrow, tall cobbled streets are a labyrinth of endless adventure punctuated at regular interval with coffee shops. From the towers stunning views are to be had in all directions, with vistas into Spain or deep into the Alentejo in excess of 50km. One of the many highlights of our trip and the title of this post, a restaurant that goes by the name of Sabores de Marvao, the flavours of Marvao. A wonderful restaurant run by Jorge and his family. Here the food is excellent. Just how I like it, uncomplicated and totally delicious, washed down with a house red and all finished with a bica. All wonderful and highly recommended. It is well over a year since I made my last post. On reflection I think it is not a good idea that someone with ASD actually has a blog. I can have long periods of silence punctuated by intense short periods of verbosity. In recent months there has certainly been quite the shift in the political world, indeed, perhaps an earthquake of yet undeterminable magnitude. In my self-contained and insular world shift also happened. As the Autumn of 2015 ebbed away the last roll of acetate passed through my Leica M2. Inexplicably, I stopped. I have not used film since. It came to a sudden and very abrupt halt. As autumn seeped away and drifted into the monochromatic drab bleak house of Winter so did my mood. I gave serious thought to the unthinkable - ending photography. I sold most of my kit. Then bought some more, sold it, bought some more and then sold it and eventually ended where I began. I then decided NOT to spend anymore money on kit. I know, I know, most of us have probably said that. I just seem to be going around in a circle buying kit, selling kit, all an aimless dance. I started 2016 with just my Olympus E-1. I bought a Leica M8 as I really enjoy the hands-on experience with the Leica M class. The output was unsatisfactory. In Lightroom they were awful. So I tried Capture One Pro 9 and that was an improvement. The E-1 was really awful in C1 and I especially didn’t like the bite of C1 clarity and the “mushy” effect when pushing the Olympus’s files. So C1 went and that meant the M8 had to go. Next on the list was the Fujifilm X100T and X-Pro1. Both cameras produced really, really, nice files and they both performed very well when I had a holiday in the Lake District in September 2016. BUT, and there is always a BUT. I did not like the hybrid finder. It is especially weak when trying to focus on a close foreground objects. That was, for me, pretty intolerable. So off to the bay-of-e they did go. That left me with the - you guessed it - the Olympus E-1. Spring of 2016 saw the desire to shoot colour take root and it leapt into full bloom as Chaucer put it “Whanne Zaphirus eek with his sweete breeth”. The warming Spring breeze stirred life from the still sullen Earth and gave forth its bloom of “vertu engendered is the flour”. I started to drink deeply from the cup that runneth over, the cup that is colour. I craved colour to break the stranglehold of that unremitting and unforgiving season of darkness. The light returned. The colour returned. This I feel. I purchased the Panasonic LX100 and within a month it was replaced by its Leica variant. A few months later the Leica was replaced with the Panasonic TZ100, which, remarkably I still have. This remarkable little pocket camera will be the subject of a post in the coming few weeks. The problem with the LX100/Leica D-Lux (Typ 109), if I can actually call it a problem, was the short focal length. The lens is razor sharp but far too short. If it had, say, the range of 24-100mm it would be a keeper. So, that now leaves me with the old Olympus E-1 and the Panasonic TZ100. Soon, both were joined by the Leica Digilux 3 of 2006. That is when I made that fateful promise of not spending any more cash on photography kit. If I can back-track a little. My exploration with digital imaging began in 1996 with the Casio QV-10 and since then I have had so many digital cameras that it is embarrassing. When I reflect on why, I find the root causes to be boredom, frustration, depression, dissatisfaction and gadget lust. For the past 12 years I have had the Olympus E-1, other cameras have come and gone, but I keep coming back to the E-1. What does that say? I find the E-1 the most satisfying camera I have ever used. It feels good in the hand, looks totally svelte and I love the quality and colour of the output. And those factors are worth all the megapixels in the world. The E-1 stays. To finally bring this post up to June 2017 being so impressed with the TZ100 I purchased the FZ1000. Made many fine pictures with it but sold it to upgrade to the Sony RX10M3. This is a few steps up from the very plastic feeling FZ1000. Also the lens on the FZ is a little soft at the long end. The Sony on-the-other-hand is still sharp at 600mm wide open. More on this awesome do-it-all later. Fairfield and Helvellyn. Fujifilm S5 Pro. Leica Digilux 3, Leica 14mm to 50mm lens. Fedw wood, Chepstow. Leica M8. Wild Horse on Pen Cerrig Calch. Panasonic TZ100. Pen yr Ole Wen, Snowdonia, North Wales. Olympus E-1. Piercefield House, Chepstow. Wales. Olympus E-1. Crib y Gath, the Cat's Back. The only part of the Black Mountains to be in England. Olympus E-1. The Alien rock on Crib y Gath, Black Mountains. The English bit.